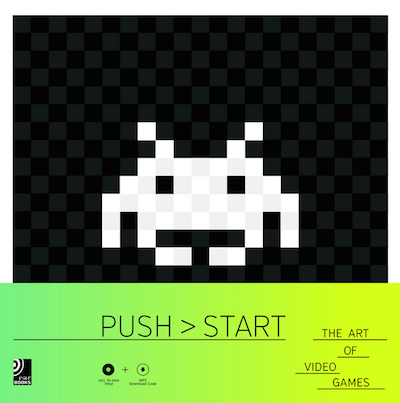 Push › Start: The Art Of Video Games, by Stephan Gunzel, features screenshots from over 200 classic video games. 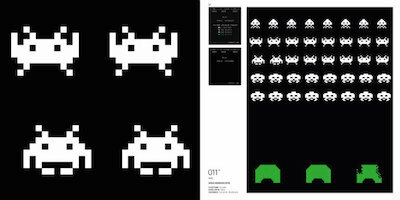 Many of the games (especially arcade games, such as Space Invaders) have low-resolution graphics, producing a kaleidoscopic effect. 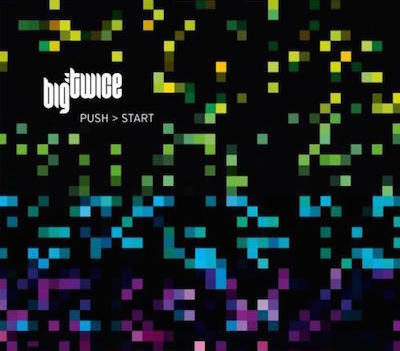 The book itself is lavishly designed, with full-page, colour illustrations throughout, embossed front and back covers, and even a 10" coloured vinyl EP featuring remixes of video game theme tunes (including the iconic Super Mario Bros theme) by Big Twice. The games are classified broadly chronologically according to their technology (8-bit, 16-bit, 3D, and HD), providing "a comprehensive exposition of video games from their inception to the present day." Steven Poole's Trigger Happy (2000) has more analysis of video game aesthetics, Leonard Herman's Phoenix (1994) is a more detailed history of the gaming industry, and Tristan Donovan's Replay (2010) has more international coverage, though Push › Start is unrivalled as a visual celebration of more than forty years of video games.